Tony Welninski started as a part time security guard back in 1974 while he was a full time Chicago Police Officer. After his retirement from the police force he continued to work as a security guard at the bank. Tony was one of the first police officers Community hired as a security guard and is the longest serving of all the bank’s security guards. Cleven said, “We appreciate Tony’s leadership among our security guard force.” Though his job was to work as a security guard, he came to know many customers over the years. Tony often greeted customers as they entered the office and helped them determine who among the bank’s staff they should see. Tony also has an interest in photography and served as the bank’s unofficial photographer at employee. Community Savings Bank is located at 4801 W. Belmont Avenue, Chicago 60641. Telephone: 773-685-5300. Website: www.communitysavingsbank.com. 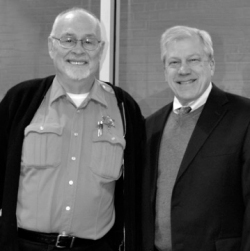 Tony Welninski retired after 40 years as a security guard with Community Savings Bank. He is shown with Dane H. Cleven, President and Chairman of the bank.